The Lightning Detection system I spoke of in the last MountainWeather Blog is now up and running and working pretty well. 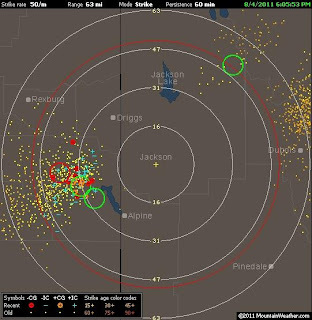 “Live” lightning strike data is now available for Jackson Hole and it can be viewed by going to mountainweather.com and clicking on the Lightning Map under the Jackson Hole drop down menu. Or, just click this link: Lightning Map. Sample Map from this past Thursday Night's Thunderstorms, before they hit Jackson. If you open another browser page along side this one, I will guide you through how to read and interpret these maps. Once you have the Lightning Strike Map page open, you will find two maps on this page………. Along with local satellite and radar map sat the bottom. The top map is a “static” map or a “screenshot” that is zoomed out to 63 miles from the center. The white rings are in miles from the center, and the center of the map is right over the top of Snow King Mountain, just above the Town of Jackson. The large red ring is the 50-mile mark, out from center. The lower map, further down the page, is an “active” map that goes out to 180 miles from center. It has some user controls that allow you to zoom even further out, to have a look beyond 300 miles. What you see out that far though is unreliable. From the testing done over the last month or so, I have found the useful range of this instrument to be between 120 and 150 miles. Beyond that, the accuracy of strike placement and detection of all strikes is inconsistent. This system has been working really well tracking the location of strikes and thunderstorm intensity within a 60 to 75 mile radius. The symbols on these two maps are roughly the same. 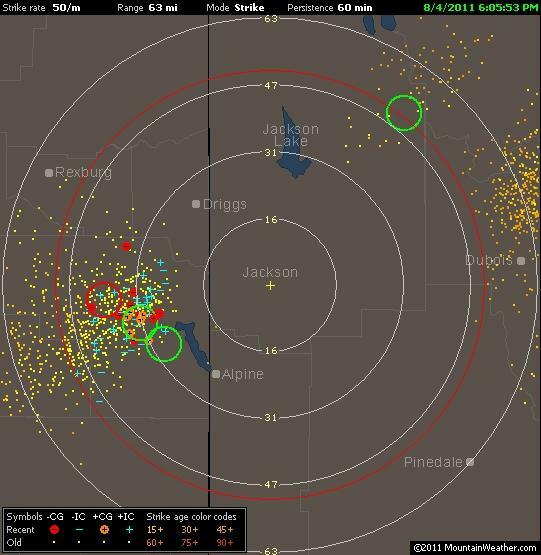 Big red dot is a recent negative ground strike and big orange dot is a recent positive ground strike. Most important difference between the two is the positive ground strikes are much more powerful, and are usually the strikes that kill people or start fires. The + and – symbols are in-cloud lightning flashes, either between two clouds or within a single cell. These bolts are not striking the ground, but they may be an early indication that a thunderstorm is developing. All of these symbols become smaller dots on the map after a minute and a half (90 seconds). The small dots are old strikes, both ground and in-cloud. When a cluster of strikes occur in the same vicinity the TRAC system kicks in (Thunderstorm Ranging and Acquisition) and analyzes the thunderstorm and tracks its progress and intensity. These will appear as green, yellow, or red circles on the map indicating the approximate location of the thunderstorm and its strength, weak, moderate, or strong thunderstorms, depending on how much lightning they are producing. Right now, Snow King Mountain uses this information to make decisions about when to stop loading the summit chairlift. The software used with this sensor has an alarm system built in that is pre-set to 50 miles (thus the red ring on the map). Whenever lightning is detected anywhere within this 50 mile radius, an e-mail alert is sent out to the chairlift operations workers at Snow King. In this alert message the bearing (compass direction from town, the strength of the storm and whether it is intensifying or not, are all indicated in the message. Like I said before, this sensor and these maps in no way assure that you will be magically protected from lightning strikes. It does provide you with a useful tool that can increase your ability to take some action to avoid dangerous lightning that might be approaching. Special thanks to Snow King Mountain fro throwing some money at this project to see if it would work, and to Adam Shankland and his crew at Snow King for helping with the installation and adjustments this past month, one time with thunderstorms knocking at the door! Also a big thanks to AJ Best of Gliffen Designs for doing all the programming and networking work that had to be done to be able to publish these maps “live’ on the internet. Feel free to contact me if you would like more information about this sensor, or the alert system.